PDF (which if you convert to doc, you'll have the fonts embedded). Will work on the meter, but now you can too.. without the hassle of formatting the text. Lessee what we come up with? This seems to be my smoking-gun proof that whoever did Beza's text, COUNTED SYLLABLES to get that first amen legw humin. Since no scribe even knew syllable counting existed, seems pretty likely that the way to PROVE THE AUTOGRAPH is to find a copy that proves SYLLABLES WERE COUNTED. http://www.brainout.net/BezaeD05M05A-Mk13-2.jpg . Notice how nearly every line begins with a conjunction or prep. That's what you'd need to do if COUNTING SYLLABLES PER CLAUSE. But I see no syllable counts there. Yet that style of listing the text lines is so unusual yet cannot be alone, I bet there are other mss 'out there' which do the same: some, maybe even have counts in the margins? I hope it violates no copyright laws to show the pic, since its point is to demo the text's uniqueness, not make money on it. Just compare the draft of Mark 13 I'm working on now at the first 119 syllables versus Matt24 and Luke 21. Again, I inserted all the relevant CNTTS variants in BW9 into the Mark 13 text, and then struck out the ones I didn't count, just as in the Template.. but here I counted some of the variants. Here's the pdf for Mark 13 I'm working on. COUNT THE SYLLABLES to the last amen legw humin and see how they SEVEN. The revisions don't change the syllable counts above, but I'm breaking Luke into more visible clauses, fixing Matt25:30b to 14, etc. Totals at right columns remain the same. If you'd rather have docs, and you have BW fonts, let me know. Ok, so I metered Mark 13 using the Template you provided. Thank you so much, it made it so much easier. I tried to follow the Westcott and Hort 1881 manuscript (simply because I find it reliable in many cases), but did deviate in two instances. I used ποιήσουσιν (4 syllables) rather than δώσουσιν (3 syllables) in Mark 13:22, and I omitted the αὐτοῦ (2 syllables) in Mark 13:27b. I made these changes, because they appear to work better with the meter, but the whole thing might work better if we use a combination of different variances. Mark 13:30 ends at 1052 syllables (because of the hoti). I don't know what to make of that. Also, Mark 13:32b-35 is a solid 126. I find that a bit odd, so I'm wondering if some of those clauses could be broken down even further to yield more sub-sevening. I will experiment with that later. Okay, so what are you using as the meaning of the two datelines? 42 years before 69 AD is what? And how is it that 42 relates to the text of admiring the buildings? 126 years before 69 AD is what? How does it relate to the disciples? Ending count is 1246 so 1276 AD. What's important about that? 42 years prior to 69 AD could be the start of our Lord's ministry in 27 AD, since He is the true Temple. Then 126 years prior to 69 AD could be the division of the Hasmonean kingdom into 5 districts by Aulus Gabinius in 57 BC. Since Judah fell with the destruction of Temple in 70 AD, maybe the second dateline is playing off the disintegration of the Hasmonean kingdom. The other meter you want to proof is the total. What does it mean? 1246 is 1050+196. Why? I'm doing the same: why is 'my' 1281 the total? 1050+231, so I can claim Mark's evoking the meter of Daniel 9:24-27, but why the PAST total, and why include the 14? If I then add up all the uniquely-occurring initial NT dateline meters I get the same 231 total, including the yet-future '7' dateline meter of John's Gospel. Okay, but is that coincidence or intentional, and why? Again, when you get the right answer, everything is supposed to click in place like a finished jigsaw puzzle. I don't see where we got that yet. Luke 21 alone seems 'done', but I wonder, since it doesn't add more than its own initial years-to-pre-Church Mill as its total (1050+35), whereas Matthew and Mark go past those values. So there is some possibility those meters are the right ones? Okay, to your question: thinking over 'your' 196 versus 'my' 231 as the overage ending in Mark. 196=7+14+21+28+35+42+49. All the meters come from these, and all of them are used as dateline meters in the Bible I've seen so far. So 7+49=56, so the total doesn't need to go that far. As you do the actual addition, you'll see the others at each +. So it's as if, at 231, Mark ends with a meter mnemonic as an epilogue, reminding the reader of God's response to granting Daniel's prayer for more time and Temple Rebuilding. Idea that the close of the 1050 'play' is that God will grant Church more time maybe based ON Daniel's prayer, since after all Christ dies at the start of the 62nd week not the end. The sum is also equal to the initial NT dateline meters, 7+14+21+28+35+42+49+56+35 . What's interesting here is the doubling of 35 and that JOHN'S GOSPEL alone has a 7 initial dateline meter.. not written yet. So if the prophecy of dateline meters comes true then again you know Mark's Gospel Chap 13, comes from God. I wonder how many of the meters use this same style, if indeed this is the style. For Matt24's 63 ends up being a prophecy of Luke's meter but also other NT books (not all of them, unless you break the 63 into 7s). Luke ends with 35, which ties back to his initial chapter meter, and of course Matt24 does too. Bigger point is for sure, that these numbers are deliberate. Whether we can say the above meanings are the right interp of them, is a whole diff kettle of fish. Here's an interesting (copyrighted) writeup by a Cambridge guy on how the Franks reacted to some strange weather they experienced in 830-875 AD. Compare that to the same periods in each Luke, Mark, and Matthew. The meter doesn't match but does help us to see what people were thinking that does fit the text. Okay, I needed to make changes due to the variants. Some of them I'd ignored, were so universal and made the meter work so aptly, it seems almost certain that Mark intended them. Much better sevening resulted, with patterns I didn't notice before. Same name, but the online version posted earlier is still preserved. Here, only in this forum, is the revision. Some meters still bother me. But it's a lot closer, probably, in this revision. Total meter is unchanged, cuz it's a shorthand metaphor for granting a new 490 through to the end of CA, to say '231'. Compare this gif of the rise of the Mongol empire and its stopping, to the similar years in Mark 13. Notice that Mark amalgamates both Matt25 virgins and three-slaves parables in that ending. Looks like Mark might be focusing on the Eastern Empire, whereas Luke is focusing on the West? So Matt 24-25 is tracking general Church trends, as a master theme, while Luke tracks West and Mark tracks East? That might explain why John never wrote about the Olivet Discourse, but instead was given the Book of Revelation. He was give the three strand of prophecy woven together into one. Remember, these were the guys who ALWAYS HAD AND COULD READ the Greek. Latest Mark 13 pdf now online, http://www.brainout.net/Mark13Meter.pdf and is NOT the same as the original uploads in this thread. Am still editing it also. As far as mapping out how Mark diverges into the history of the East starting in 325 AD, there's too much to explain. He first plays with the locations when Constantine and his sons all die, which most people TODAY wouldn't even understand why, that's a witty segue. Also Siege of Constantinople (many times in history), Byzantine Empire articles in Wiki are helpful, plus many of the 'timeline of Constantinople' or 'Byzantium' sites (some better than others). Okay, turns out Mark 13 is doing for Byzantine history what Paul did for Western Rome, and it's a biting annual prophetic satire. Example: Mark 13:34's phrase 'and He gave to His slaves' marks the Latin sack and takeover of Constantinople in 1204. Many specifics like that one. Here's the revised meter, but am still going through the anaphora keywords so the text will change again. For like Paul (so the reader would see it quickly), Mark constructs anaphora out of keywords, starting with Blepw; it starts with very alive Titus' future death as the first occurrence of Blepw; next is Septimius Severus; next Blepw is the 'center' on the yet-future Constantine; but Blepw does not cover his own death, but when he kills Licinius his brother-in-law, his own wife and son Crispus in rapid succession. So he's seeing their deaths which he caused, and they're not seeing anything, get the pun? The ide occurrences also seven to Blepw, but I don't see any Bible stress. They are all turning points in Byzantine history, usually from recovery back to decline. Death is stressed each time, of the Emperor in question, though the first ref is to Nero who doesn't die at the benchmark, but killed his mother then. Of course, Nero is newly dead when Mark writes, so the connection will be a pregnant one. So later they will be added, so the 'nest' depicted in the Notes of the pdf will be changed. Just as Paul had done with the eta's in thelematos, Mark uses Blepw to show reversal by a successor. The successor might be bad or good, but Blepw rulers tagged were all reformers. 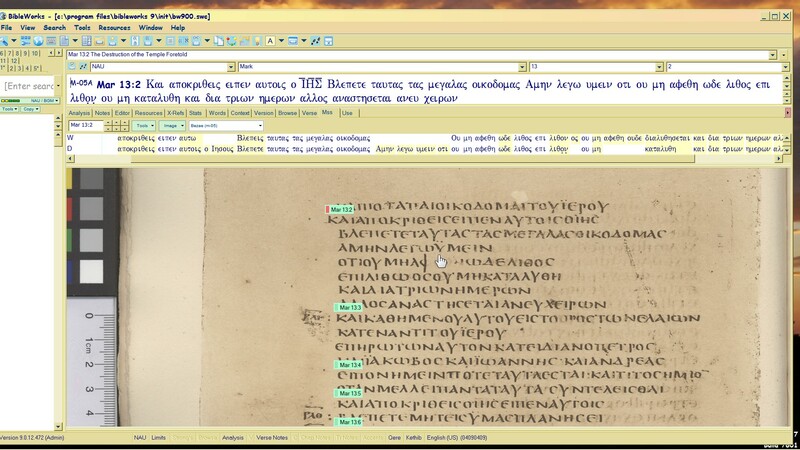 This tagging continues with the kurios and huios keywords, as each such time was a turning point in getting Bible manuscripts out of Byzantium and into the West. Scholars know this already, but they don't know Mark is tagging the years it happened, using the same meaning of those tags as in Matthew 24-25! I wonder now what Luke might be tagging, tho he uses almost none of these keywords, if I recall correctly. Last edited by brainout on 14 Feb 2017, 04:59, edited 1 time in total. Update: http://www.brainout.net/Mark13MeterR.pdf now has Byzantine History, revised meter which is spot on re that history, balances more obviously to Matt24/Luke21 as well, astonishing stuff. The above playlist now has 96 vids, so 10 more on Mark 13 and how Rev17 uses it, with many more to come. Mark 13's Meter was updated, so use the link again if you want to see it, http://www.brainout.net/Mark13MeterR.pdf . Can now download en masse from the downloads directory, http://www.brainout.net/downloads . I also have to redo ALL of the Revelation 17 videos. 7-syllable error moves all the syllable counts up. Words philas and blasphemias each have NO elisions, so add one syllable each when you get there. Current 227 should be 5 higher, math error, so it becomes 234 with the elision corrections. So make those changes. Ruins all the Rev videos I've done but the NEW results are FAR BETTER and more biting sarcasm, so worth it (i.e., musterion standalone word now references the Council of Nicaea and Constantine dies at 'whore'. Shortcut, use current Rev17R.pdf and just add 7 syllables to the 227, read as if those extra seven were there, as the corrected year.